Alanna Furbert, Swaynisha Outerbridge, Jodi Maronie, Dani Usher, Carla Emery, Shawnette DeRosa, Severin Tucker, Bryce Williams, Abimbola Bademosi, Brendal Simons, Chardinae Wilson-Trott, Karene Smith, Monique Paul, and Monica Smith all completed the Bermuda Teacher Induction Programme. This was announced by Minister of Education Diallo Rabain in the House of Assembly today [June 15] as he provided an overview of the Bermuda Teacher Induction Programme [BTIP]. “This programme assigns mentor teachers to novice teachers for the purpose of providing individualized support, coaching, and professional development during their first and second years of teaching within the Bermuda Public School System,” the Minister said. “New teachers, or Inductees, as they are called while participating in the Bermuda Teacher Induction Programme, receive from experienced mentor teachers sustained support that is grounded in research-based best practices and which is focused on fostering excellence in the classroom. “In keeping our intent to implement more rigorous standards, the 2018 BTIP Inductee cohort took on the special challenge of completing new induction programme requirements. “These new requirements required Inductees to be more reflective and to take time to document evidence of successful pedagogical practices. These practices were captured in comprehensive professional portfolios inclusive of a video lesson analysis, instructional artifacts and a reflective essay. “This year, BTIP also recognized the second annual New Teacher of the Year. The New Teacher of the Year award was established to “celebrate excellence in teaching” by highlighting a novice teacher, and Mrs. Karene Smith was named the BTIP New Teacher of the Year winner for 2018. “The effect that teachers have on student achievement is well documented, and ensuring that our teachers are prepared for the classroom is a priority. These teachers have demonstrated a vested interest in our students. “Likewise, our mentors, Mrs. Leone Charles, Ms. Laurel Burns, Mrs. Linda Holdipp and Mrs. Jeanna Bean have shown a vested interest in the personal and professional development of our novice teachers. I thank them for their efforts and contributions. “Our mission is to provide all students with equitable access to holistic, varied and high quality instruction that is culturally relevant and empowers students to reach heir full potential. 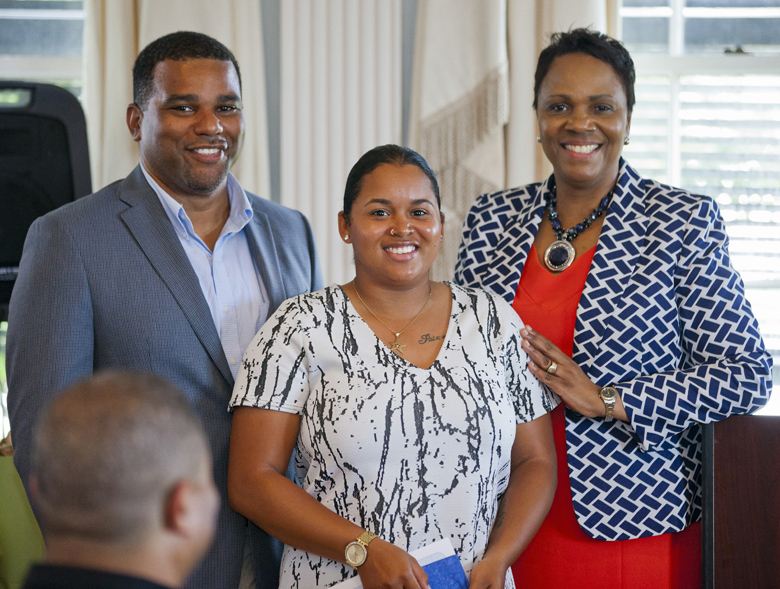 I am pleased this morning to share with you, and members of this Honourable House, a report on the teachers who have successfully completed the Bermuda Teacher Induction Programme. The Bermuda Teacher Induction Programme, for short, BTIP, is a programme which formally began in 1989. 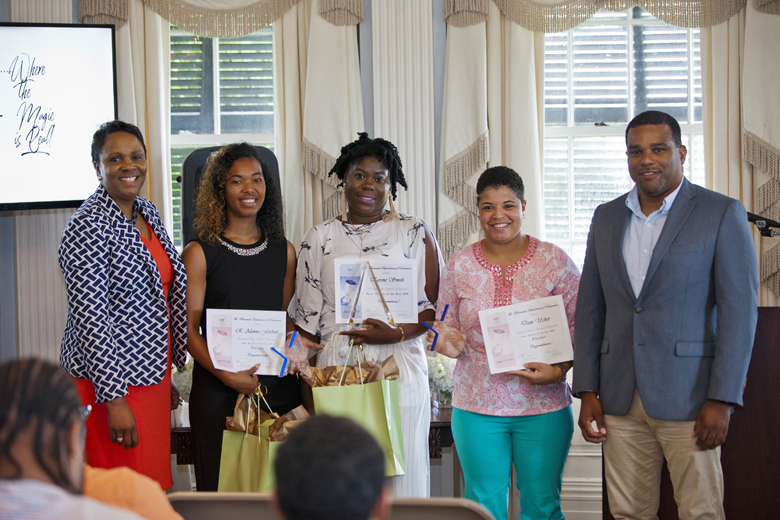 This programme assigns mentor teachers to novice teachers for the purpose of providing individualized support, coaching, and professional development during their first and second years of teaching within the Bermuda Public School System. 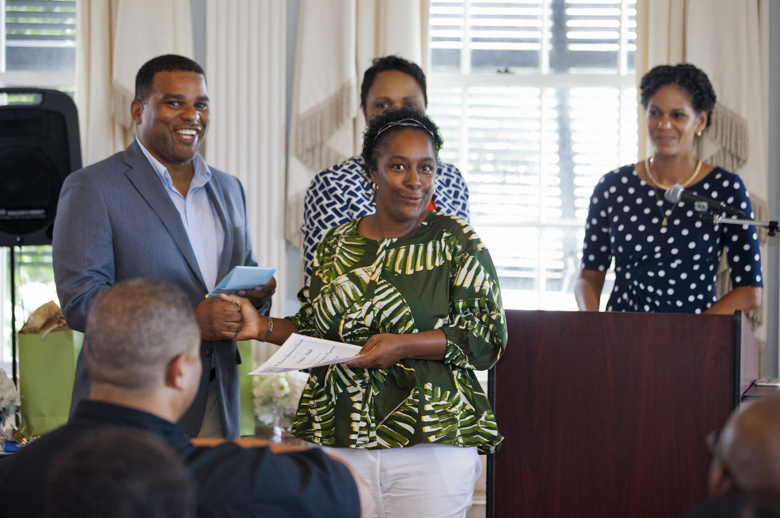 New teachers, or Inductees, as they are called while participating in the Bermuda Teacher Induction Programme, receive from experienced mentor teachers sustained support that is grounded in research-based best practices and which is focused on fostering excellence in the classroom. In keeping our intent to implement more rigorous standards, the 2018 BTIP Inductee cohort took on the special challenge of completing new induction programme requirements. These new requirements required Inductees to be more reflective and to take time to document evidence of successful pedagogical practices. These practices were captured in comprehensive professional portfolios inclusive of a video lesson analysis, instructional artifacts and a reflective essay. 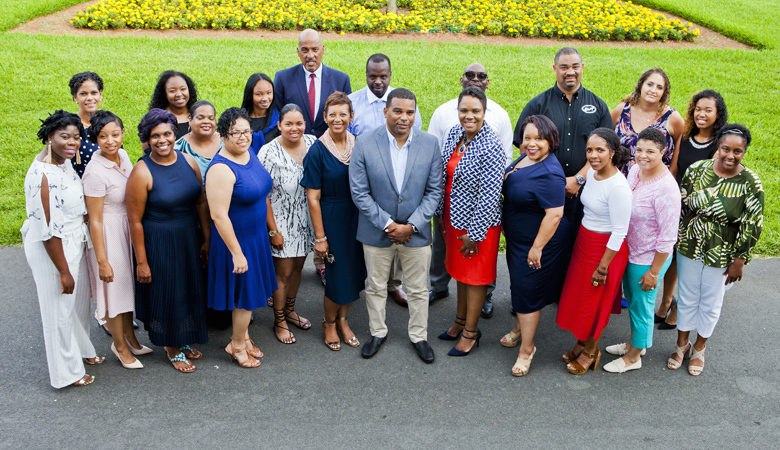 I am pleased to report that this year, fourteen  teachers met the more rigorous requirements for successfully completing the Bermuda Teacher Induction Programme. Given that this is a notable achievement, please allow me to share some information about each of our Inductees. Ms. Alanna Furbert is a special education teacher at East End Primary. She began her career as a middle school learning support teacher, transitioning during her second year, in response to an urgent need at the primary level. What matters most to Ms. Furbert is how she impacts student. She understands that every child has a different learning style and pace and that each child is unique and capable. Ms. Furbert is a graduate of CedarBridge Academy. Ms. Swaynisha Outerbridge teaches English and English as a Second Language at CedarBridge Academy. A CedarBridge Academy alumnus herself, Ms. Outerbridge knows that her passion for education was ignited by inspiring teachers in her own educational career and she endeavors to do the same for her students. Jodi Maronie is teacher of Mathematics at T. N. Tatem Middle School. Mr. Maronie has always found mathematics interesting and knew that he would pursue a career in the numbers field. Coming to math education from a background in financial management, he seeks to share his passion for the subject and continues to grow professionally in order to meet the needs of all students. Dani Usher is a member of the staff of Sandy’s Secondary Middle School. As an English Teacher Mrs. Usher has fully embraced the challenge of serving students, saying that it is not what she does, but who she is. A graduate of CedarBridge Academy, Mrs. Usher’s has developed a reputation for forming strong bonds with her students. Ms. Carla Emery has served the Bermuda Public School System in a number of capacities for over a decade. Ms. Emery, a professional graphic designer, now serves as the Art teacher for Dalton E. Tucker and Somerset Primary schools. She is dedicated to using the arts to build connections with students, focusing on compassion, tolerance and understanding in her classroom. Mrs. Shawnette DeRosa began serving students as a para-educator at CedarBridge Academy sixteen years ago. After years of dedicated service, she transitioned to the position of Learning Resource teacher in September 2016. In this role of increased responsibility, Mrs. DeRosa collaborates with general education teachers to ensure that students with learning disabilities have the support needed to meet their full potential. Mrs. Severin Tucker is an English teacher at the Dellwood Middle School where she has worked since 2014. In her practice, Mrs. Tucker has made it a priority to provide students with a dynamic, engaging and enjoyable classroom environment. Her goal is to help students immerse themselves in the process of writing. Mrs. Tucker also owns and manages a Pilates studio. Mr. Bryce Williams, a teacher of Spanish at Dellwood Middle School, is committed to enhancing the instruction of the Spanish language by exposing students to the culture of Spanish-speaking countries around the world. He promotes a resilient work ethic, with the hopes that children will leave his classroom knowing anything is possible with dedication, consistent hard work and effort. Abimbola Bademosi is a longtime music teacher who has served the Bermuda Public School system. Mr. Bademosi is currently a peripatetic music educator at Francis Patton Primary and East End Primary. He is a highly dedicated instructor who shares his passion for music through lessons in chorus, recorder and percussion. Brendal Simons has been working in early childhood education for the Bermuda Public School System for seven years. Initially working as a substitute teacher, Ms. Simons became a full-time lower primary teacher at Francis Patton School in 2016. In September 2017, she shifted up from primary one to primary two juggling new curricula, multiple ESL students, and several students reading below expectations. A highly reflective teacher, Ms. Simons shifted gears and implemented new strategies in order to reach all learners. Chardinae Wilson-Trott teaches at St. George’s Preschool. She has focused her attention on using intentional language as well as deepened her understandings around student observation, assessment, and data collection. She has also proven diligent in her quest to better understand The Creative Curriculum, undergoing more than ten hours of independent online study – including the Teaching Strategies GOLD Interrater Reliability Certification for Preschool/Pre-K.
Karene Smith is a teacher at St. David’s Preschool. Mrs. Smith has a deep understanding of her students’ needs and a strong understanding of their developmental stages. Not only is academic progress at the forefront of her intentions, but also their social development. She demonstrates a genuine commitment to student growth and building strong relationships with her students and families. Mrs. Smith graduated from The Berkeley Institute. Monique Paul has been with the Bermuda Public School system since 2010. Initially hired as a para-educator for special needs students, Ms. Paul subsequently earned a Master’s degree in Special Education and now she works to effectively reach a range of students with academic and behavioural challenges. Monica Smith currently teaches at East End Primary. Monica’s journey saw her shifting down a grade level after her first year, with a commitment to the challenge. She has found these initial two years of teaching a most rewarding experience. As part of the changes to the BTIP Programme requirements, for the first time, Inductees had the opportunity to be honored as completing BTIP with Distinction. To be eligible for Distinction, Inductees were required to complete all portfolio requirements, including securing membership in a professional organization. Inductees who completed the programme with Distinction were first nominated by their principals to receive the honor and then confirmed via a review of portfolios and the decision of an Assistant Director Vetting Team. We congratulate Ms. Alana Furbert, Mrs. Dani Usher, Ms. Brendal Simons and Ms. Chardinae Wilson-Trott on completing the programme with distinction. 3. Clear passion for and commitment to the teaching profession and the school community. I celebrate Ms. Alana Furbert and Ms. Dani Usher as finalists for this award and congratulate Mrs. Karene Smith as the BTIP New Teacher of the Year winner for 2018. The effect that teachers have on student achievement is well documented, and ensuring that our teachers are prepared for the classroom is a priority. These teachers have demonstrated a vested interest in our students. Likewise, our mentors, Mrs. Leone Charles, Ms. Laurel Burns, Mrs. Linda Holdipp and Mrs. Jeanna Bean have shown a vested interest in the personal and professional development of our novice teachers. I thank them for their efforts and contributions. Our mission is to provide all students with equitable access to holistic, varied and high quality instruction that is culturally relevant and empowers students to reach heir full potential. The Bermuda Teacher Induction Programme is committed to this mission and our Government remains committed to this mission.